Sometimes new forms of technology need a dress rehearsal before their premier. Early airplanes were like this, seeming to offer a lengthy prelude to Kitty Hawk. A succession of imaginative tinkerers and engineers worked on heavier-than-air machines for decades before the Wright brothers made a debut. These early aeronauts tried out innovative designs and made small improvements. Perhaps there was a public demonstration, featuring a willing assistant or the inventor himself at the controls of the flimsy craft. Perhaps there was a crash. 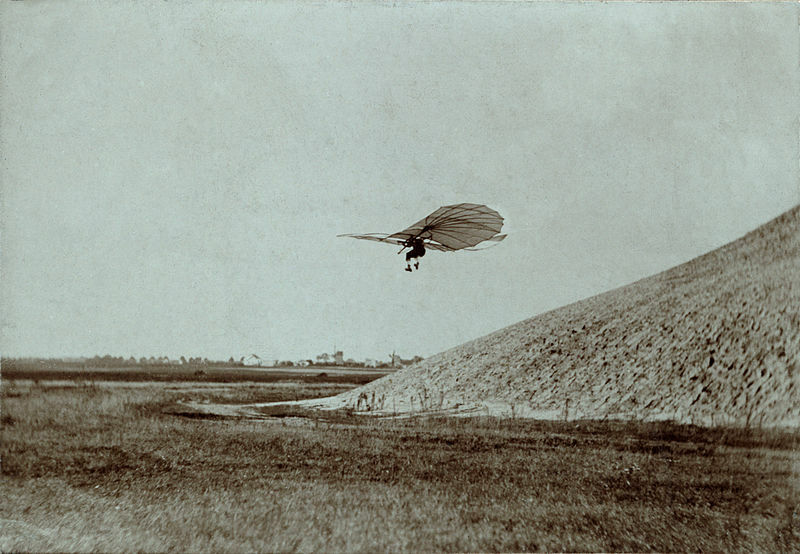 Otto Lilienthal performing a gliding experiments. Ca. 1895. It is not as easy today to picture how high-stakes technologies develop, no more in aeronautics than in areas like biomedical engineering. These rehearsals have largely receded from view. Yet we know an ever growing number of novel biomedical devices can be found, surgically implanted in human bodies across the globe, filtering and pumping blood, healing wounds, and electrically stimulating failing nerves. Someone created the prototypes. Perhaps there was preliminary work with laboratory animals. Manufacturers were convinced to scale up production, and experimental trials of effectiveness were undertaken. World’s first Lithium-iodide cell powered pacemaker. Cardiac Pacemakers Inc. 1972. While these processes are closely managed at present, the creation of earlier medical devices had some of the feel of pre-Kitty Hawk aeronautics. The gastric freezing machine created by the surgeon Owen Wangensteen in 1958 for the treatment of peptic ulcers looks in retrospect like such a dress rehearsal. Wangensteen’s invention was similar to the early flying machines in another respect too: the testing took place in a way that was both public and tinged with tragedy. Owen Wangensteen came up with idea for a gastric freezing machine while working on the surgical treatment of peptic ulcers. Bleeding ulcers were a staple responsibility of surgeons through the 1950s and 1960s, when, at their peak, they were a cause of death for nearly 10,000 people annually in the United States. Surgical treatments developed along several different lines during this period, but converged on the common goal of reducing erosive gastric acid in the stomach. Surgeons tried resecting the portion of the stomach that contained acid-secreting cells and cutting the nerves that triggered the secretion of acid. No approach worked perfectly, and Wangensteen as a leader in academic surgery and a pioneer in surgical research was looking for a better solution. In the late 1950s, Wangensteen began to experiment with the use of deep cooling of the stomach as a treatment for ulcers. His investigations were inspired by experience with ice-water lavage of the stomach as an emergency treatment for bleeding ulcers. Extending the procedure to animals in the medical school laboratory, Wangensteen showed that temporarily freezing the thin lining of the stomach appeared to reduce acid secretion, and reducing acid had been shown to lessen or even eliminate complications from ulcers. Owen H. Wangensteen during his residency at the Mayo Clinic. From L’Etoile du Nord, 1994, Peltier & Aust. © Wangensteen Historical Library. Since ice water treatments caused the recipients risk and discomfort, and were doubtless messy, Wangensteen began tinkering with alternatives. He turned to a local refrigeration manufacturer, the Swenko company in Minneapolis, to construct a rapid cooling device that could operate inside the stomach of a living person. Together Wangensteen and the Swenko engineers devised a mechanism that worked by pumping freezing alcohol through a loop of balloon inserted on a tube and inflated in the patient’s stomach. Wangensteen’s first article on the procedure reported on experiments with rats, frogs, minnows, cats, and dogs, and concluded with detailed case reports of five of his ulcer patients treated with the device, all of whom experienced rapid and significant reduction in ulcer symptoms. Although treatments with Swenko’s freezing apparatus were initially performed in the surgical operating rooms, the procedure was relatively simple and usually caused little inconvenience. A subsequent report from Wangensteen’s group offered similarly favorable short-term results in 17 patients, and the new device began to attract public interest. Word of mouth spread through the medical community, and soon the national press caught on to a great story in the making. By the mid-1960s thousands of patients across the United States had been treated, and gastric freezing devices were being sold in rising numbers by several different manufacturers. 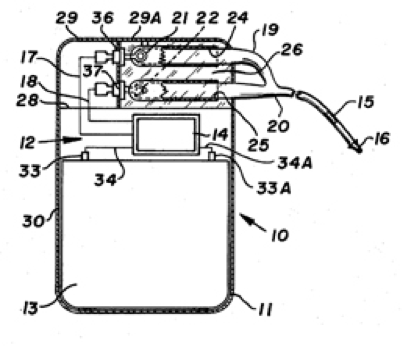 Schematic drawing of the device employed for obtaining local gastric hypothermia. In Wangensteen, Owen, Harlan Root, Conrad B. Jenson, et al. “Depression of Gastric Secretion and Digestion by Gastric Hypothermia: Its Clinical Use in Massive Hematemesis.” Surgery 44, no. 2 (1958): 265-74, illus. p. 270. But the rapid success of Wangensteen’s device attracted as much skepticism as praise. Surgeons who had struggled for decades with the problem of ulcers may have experienced doubt about a device that seemed to provide a remedy with the flip of a switch. In April 1962, Wangensteen gave an interview to “Time” magazine on the new procedure, suggesting that it might eliminate the need for much ulcer surgery in the near future. Surgical groups and others set to testing gastric freezing treatment with increasingly rigorous methods. Out of the gate, the treatment seemed very helpful. But there was a weakness that soon became evident. Through this period, ulcers were diagnosed either at the time of an acute episode of bleeding or perforation, or by a patient’s symptoms, since the use of fiber optic endoscopes to inspect the stomach, for example, was in its infancy. Since gastric freezing could not be used with seriously sick patients, its reputation was based primarily on the evidence of patients who came for treatment with ulcer pain and left feeling better. One man observed by a reporter from “Time” left the hospital after treatment and went out to sit down for his first “big meal” in a long while. But physicians also found that many patients who initially felt quite well later had relapses and had to return for a second treatment. Had the ulcers really been healed in the first place? Physicians in the late-1950s were becoming aware of the considerable power of the placebo effect, especially in association with an impressive and novel medical treatment like gastric freezing. Did Wangensteen’s device heal ulcers, or did it just convince patients that they must feel better? In the 1950s and 1960s, physicians were gaining confidence in the kind of experiment that could test for the placebo effect. Testing required a blinded comparison of patients who had received gastric freezing against patients who only thought they had received gastric freezing. Near the peak of the popularity of the procedure, the surgical division at Bellevue Hospital joined several other groups who resolved to conduct such an experiment. It would be a blinded, randomized trial of gastric freezing, recruiting patients from Bellevue Hospital with debilitating stomach pain and confirmed ulcers. Agreeable subjects were randomly divided into two groups, with one-half to receive the standard freezing treatment described by Wangensteen. The other half – referred to by the investigators as the “sham freezing” group – had similar preparations but they quietly received only room-temperature water circulated through the device. Following a single treatment in the trial, several patients reported and would continue to report “complete resolution” of their symptoms for one and two years of follow-up. But all those who experienced such lasting positive results had received the sham treatment. Comparison between the freezing treatment and the sham, placebo treatment showed little evidence of a true therapeutic effect from gastric freezing. Sales of the Swenko gastric freezing device — and likely of its imitators — fell off quickly. Sales of Gastric Freezing machines by leading manufacturer. Fineberg, Harvey V. “Gastric Freezing: A Study of Diffusion of a Medical Innovation.” In Medical Technology and the Health Care System, edited by Committee on Technology and Health Care, 173-200. Washington, D.C.: National Academy of Sciences, 1979. Illustration p. 179. Physicians had opened a new door in the development of implanted medical devices, but there was hesitation before rushing in. The experience with gastric freezing rehearsed the steps to create and test such devices, but left a legacy of debate. Implanted medical devices and invasive surgical procedures intended to relieve symptoms might derive substantial advantage simply from a patient’s belief that they worked. Further testing seemed needed. But how feasible was it to perform full-scale placebo testing of medical devices? Weren’t the participants in the placebo arm of such a study intentionally deceived? Who would agree to such an experiment — and with what inducement? Was it ethical to feign treatment with a potentially risky intervention? It was, with a touch of irony, not until the advent of the new bioethics of the 1980s that such questions began to be thoroughly worked out. Today such placebo experimental trials are routine and are promoted in the name of better regulation of risky and expensive medical devices and procedures. The first rehearsals took place a half- century ago; it was decades later before we approached a full stage production. Christopher Crenner writes about the history of medicine and medical practice in his role as the Hudson-Major Professor and Chair of the History of Medicine at the University of Kansas School of Medicine‘. He is the author of ‘Private Practice: In the Early Twentieth-Century Medical Office of Dr. Richard Cabot’ (John’s Hopkins University Press, 2005). His chapter “Placebos and the Progress of Surgery” (in Thomas Schlich and Christopher Crenner, eds., ‘Surgical Alternatives: the Uses and Transformations of Surgical Technology’) is currently under review at Rochester University Press. O. H. Wangensteen, E. T. Peter, D. M. Nicoloff et al., “Achieving “Physiological Gastrectomy” by Gastric Freezing: A Preliminary Report of an Experimental and Clinical Study,” JAMA 180, no. 6 (1962): 439-444; Owen Wangensteen, Harlan Root, Conrad B. Jenson et al., “Depression of Gastric Secretion and Digestion by Gastric Hypothermia: Its Clinical Use in Massive Hematemesis,” Surgery 44, no. 2 (1958): 265-74. Wangensteen et al., “Physiological Gastrectomy,” 439. Harvey V. Fineberg, “Gastric Freezing — A Study of Diffusion of a Medical Innovation,” in Medical Technology and the Health Care System, ed. Committee on Technology and Health Care (Washington, D.C.: National Academy of Sciences, 1979), 173-200, 174. Bashir A. Zikria, Ramon S. De Jesus, William R. Cunnick et al., “Gastric “Freezing” — A Clinical Double-Blind Study,” American Journal of Gastroenterology 47(1967): 208-14, 213, 209; Fineberg, “Gastric Freezing.” See also a short bio at http://www.biobridge-event.com/site/index.php/2009-unog-2009europe/2009-speakers-directory/206-zikria-a-bashir-prof-us.html?lang= . Surgery, like psychiatry, is in serious need of the placebo testing of old and new treatments. Trust and rhetoric appear to play a massive role. Unfortunately, these are among the most difficult types of medicine on which to apply a double blind system. Incidentally, it is interesting that some highly effective placebo treatments are not adopted as standard. After all, fake heart surgery is a great deal safer than the real thing. Of course, practitioners would resist but, perhaps more importantly, they could not convey trust to their patients, because they themselves would not attribute efficacy to the therapy..